I apprreciate the positive reinforcement for healthy and nurturing relationships with teens. As a junior high teacher I struggle with witnessing the harmful effects of mainstream society on my students every day. The lack of positive parent involvment in the lives of my students pains me to witness. If nothing else, it reminds me of the type of relationship that I want to foster between my future children and myself. Its rare that one comes across positive notation of teen-adult relationships. I can’t tell you how much this article has reinforced my personal parenting as well as my teaching philosophy. Sometimes it can be difficult to remember why God called me to this vocation, especially when the majority of the people who surround you everyday come from a different mindset that has a negative view of teens and children all together. I relish the opportunity to develop positive relationships with each of my students in order to provide opportunities for physical, mental, emotional and spiritual growth. I wish that there were more resources available for an API oriented individual working in such a mainstream occupation. The Love and Logic resources as well as many from API have served to reinforce my beliefs and have helped me develop my skills as a teacher and teen advocate. I wish more people had an oppertunity to be exposed to the wonderful, amazingly passionate, sensative and unique individuals that I get to work with everyday without the biased opinion that mainstream society adhears to blocking their sight and dampening their opinion of some of the most amazing and potential filled indivduals that grace this earth. Laurie: Your article is beautiful. I hope it inspires many parents to follow your lead. It can be terrifying when your children exhibit their anger and frustrations, but your advice is what children need. The pulling away some parents do can only make a child believe that they are not important to their parents. God Bless. I am in full agreement that all children should be honored – throughout childhood: listened to, nurtured, respected. Where I disagree is where you say attachment parenting teens means…allowing them to unschool. Yes, teens – as all children – should be able to direct their own activities, to persue their passions; but this can also be done within a respectful school environment as well (like Montessori); parents and children should feel able to choose elements of life – like schooling – that fit within their lifestyle and childrens’ personalities, without feeling they need to adhere to specifics in order to be attached parents. Including unschooling as a “requirement” of attachment parenting teens is like including cloth diapering as a requirement of attachment parenting infants. They both may fall under natural parenting choices, but they aren’t requirements of parenting in an attached way. But otherwise, I really love your expression here, particularly this line: “it means guiding them in life and cultivating a loving, peaceful relationship…fly when they are ready”. I have tears welled up in my eyes because THIS is what I believe is possible. Thank you fir writing what is in my heart and mind. This is a beautiful! As a mom to four boys, I take this advice straight to heart. As I read this I could feel the love! I am a mum with one child, my amazing son Leo. The most precious thing in my life. My greatest achievement. When I look at him and watch him grow and develop I could burst with pride at the person he is. LeO is 16 years old. He has just left school and will start college in September. My baby boy is now a young adult but the cuddles are still as prevelant as ever. Like the author my son is a young confident balanced pleasant and loving young man. He knows his own mind and is active and outgoing. My parenting technique has allowed him to grow and develop his own person with plenty of loving reassurance to help him along. Its the greatest gift. We are entering a new phase in our relationship now as he is transforming from a child to a man but the bond we have will never change. I love you leo. An excellent piece of writing it was nice to read! YES YES YES! As an unschooling mama with a teenager, I am forever frustrated by the invisible line in the sand where somehow we stop connecting via attachment theory, and start forcing our children to become independent. It’s one thing to force a toddler to be independent early – a damaging thing – but it’s a whole other world when forcing independence involves pushing a child into a world that is unforgiving, hypersexualised, and full of cars and alcohol. Children, no matter their age, need their parents behind them. Thank you so much for writing this! I wish there were more resources about parenting a teen because sometimes I feel like I am out of my depth, like I am the only attachment parent of a teenager in the whole world. Thank you everyone for all of these wonderful comments- I am so heart-warmed to hear your positive feedback and how the article reinforced your instincts. @Kelly, unschooling is the natural state of children’s learning and the way nature intended children to learn. Most other forms of education are cultural and often imposed upon children. School environments can disrupt secure parent-child attachment. My research has supported this view. @crzzi and @Rita, how heartwarming to hear from other Moms who cherish their teens and enjoy a deep connection with them! @Celeste, please be cautious around the “Love and Logic” series- They are not attachment parenting advocates and actually advocate for coercive, punitive tactics, including corporal punishment. I researched the series for my Master’s Thesis many years ago and had to go through some of it with a fine toothed comb. I do not recommend those books. Check out Jan Hunt, Pam Leo, Ashley Montagu, Jean Liedloff and my own book, Instead of Medicating and Punishing. Thank you for sharing your wisdom in such a clear way. Thanks for such a wonderful article. I am mom to two toddlers, and they are far from their teens. BUT I really love being with them, cuddling! It is so precious, and I want it to last for as long as they let it! Wonderful! Enjoyed the article. My kids go to public school but I try to be watchful for its effects. Loved the refreshing difference to reward/punishment. It makes the stress of parenting a teenager go away when mutual respect is the main goal, not “winning” arguments or controlling behaviors. I know that when my teen or I feel controlled or disrespected, it just doesn’t go anywhere and plan just doesn’t feel right! Stop referring to him as a “child” He’s seventeen, almost an adult by legal standards. Beautiful article! I just wanted to mention, as a homeschool parent and a former Montessori student, that both unschooling and Montessori share things in common during the teen years. Both are honoring and respectful of the individual, and child-led, where they’re allowed the freedom to explore their own interests. BTW- “almost” an adult is a “child” by legal standards. I agree that parents need to be reminded that children are…children even when they have a two-digit age. So many parents say, “Well, they’re nine now and they’ll be teenagers soon…” For sure, they need that bonding and reassurance especially as they move through the uncertainty that adolescence brings. What I don’t understand is the judgment I hear for parents who don’t walk the exact same path you have chosen. There are portions of AP that some people do not embrace for one reason or the other and it certainly does not harm their children in most cases. My hope is that, people who choose to take AP to the max are doing so to contribute to a more peaceful world, not to feel superior to others. This is all great, and I understand the reasoning and philosophy behind it, but how does one go from being disconnected from their teen to reconnecting, when the teen is so entrenched in “peer orientation”? This last year has been so hard on me and I really am trying my best, but nothing is working. I have obviously failed my daughter somewhere along the lines as she constantly points it out! 1. Gordon Neufeld, PhD, writes and teaches extensively about peer orientation, http://www.neufeldinstitute.com. 2. Heather Forbes, LCSW, writes and teaches about attachment difficulties, http://www.beyondconsequences.com. 3. You may wish to post your question on the API Forum, where you will be connected to experienced API Leaders and other parents facing similar situations, http://www.attachmentparenting.org/forums/home. To post a question on the Forum, you will need a login and password, which you can sign up for in the top right corner of the Forum homepage. 4. 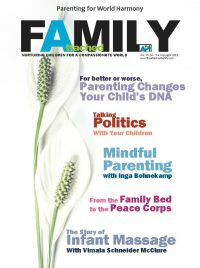 There are a number of additional articles about attachment parenting and teens available on TheAttachedFamily.com (enter “teens” in the search box). We hope you find this information helpful as you navigate this challenging period. @Alan, Adolescence is a stage of childhood, therefore, adolescents are children. In fact, although the law states that a young person is an “adult” at age 18, nature and biology say something different. Although many youth are capable and mature by 18, it is important to be aware that the human brain does not fully mature until age 24 or 25. The body, also, especially in boys, does not fully develop and complete adolescence until 24 or 25, depending upon the individual. Attuned and intuitive parents just ‘know” these facts and don’t try to force their older children out of the nest or away from emotional dependency. It is always best to allow nature to work its magic with each unique individual and to allow each adolescent to develop at his or her own unique pace. @Colleen, It is very possible to reconnect with your teen after a disconnected relationship! My book, Instead of Medicating and Punishing, is focused entirely on healing attachment disruption for children of all ages, including teens. Also, many families have found my Attachment Parenting coaching services helpful for specific 1:1 support. I loved the article. However, but I find your comment where you said people are children until their mid twenties odd. In the peaceful tribal societies I’ve read about, such as the !Kung San, young people, especially young women, become adult members of the group in their mid to late teens. That includes marriage and having their first child. Those mothers that believers in your style of parenting are following are teen moms. You mentioned Jean Liedloff’s The Continuum Concept. Jean actually praised a book claiming that adolescence is an artificial extension of childhood (based on history and anthropology) with negative effects on teens. It is by Robert Epstein. Here’s what Jean said about it(paraphrased, I don’t have it in front of me): “Although human evolution for hundreds of millennia to be fully competent adults and parents, our current society finds it convenient to view them as children. Robert Epstein makes a great case for correcting this costly error”. Our ongoing relationship with our kids is so critical in setting them up to succeed. Even in middle school/preteen/tween years, despite typical notions that kids don’t want anything to do with their parents, we (and they) know that they really do still need and want our attention and relationship. As we approach these typically challenging years, we are equipping ourselves to succeed with our son. I disagree with the assumption that our society is uncomfortable with the strong mother/son relationship. In fact, I believe it is quite the contrary. Most of my male peers as a teenager praised and reveled in the fact that they shared an unbeatable and unbreakable bond with their mothers. I also believe that our current culture, the one that places a large amount of responsibility on the woman to promote, encourage, and maintain all emotional aspects of relationships in lieu of dividing up the responsibility equally between man and woman, not only acknowledges the bond between mother and son, but it creates an adversarial atmosphere between the spouse of a man and his mother in regards to affection and fostering it. Not to sound dense, but I partially believe that our culture’s acceptance and even promotion of an emotionally invasive relationship between mother and son, while under the guise of a healthy relationship, interferes directly with a man’s expectations and unrealistic desires of a woman. Marrying a woman who takes a larger portion of responsibility than the man in every aspect is becoming more and more common. Partnerships are rare anymore.